The only thing that’s more important than chocolates, are my birthdays. That’s the way it’s always been and I’m guessing if it hasn’t changed in 37 years, why bother now? But then it’s my birthday, and ordinary chocolate cupcakes just don’t shout out Grishma! So I added a little bit of crazy & a little bit of drama with a pinch of glamor to it. Yup, now that’s me! I also refuse to call these cupcakes. I’m going to call them mini cakes, because they may be little but they’re just as delicious & just as important and remember it’s my birthday, my blog & my rules! Oh and because I used a special cak﻿e batter to make these and they are so darn dense and gooey, they are definitely a step up from boring old cupcakes. 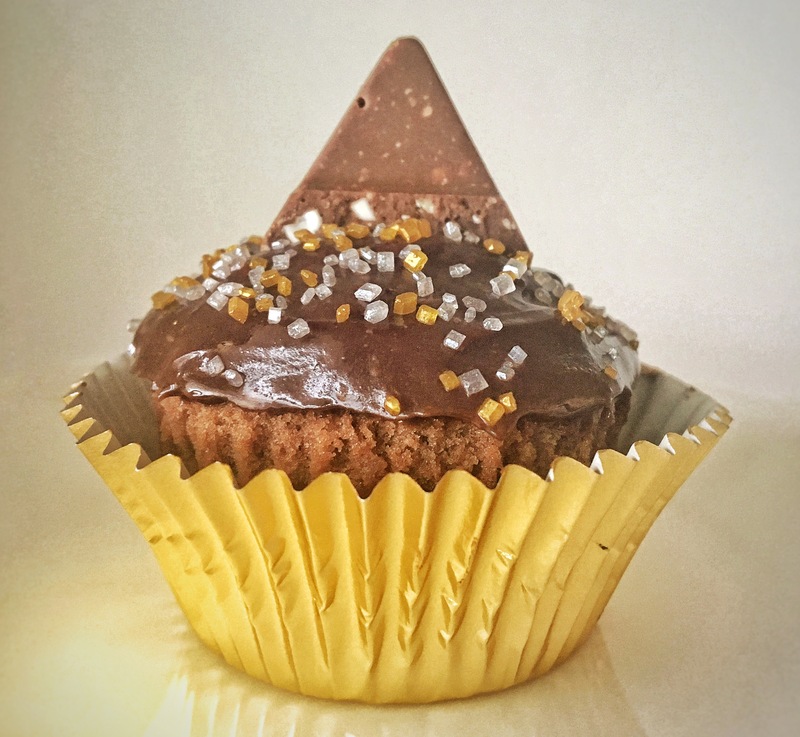 ﻿ 18 -24 triangles of Tobblerone to melt + 1 to top each of your cupcakes. Preheat the oven to 300 degrees F. Line 2 muffin tins (12 count each) with cupcake liners. In a large mixing bowl, beat the butter and sugar together using an electric mixer till light and pale. Add the eggs and vanilla and beat until light and fluffy. 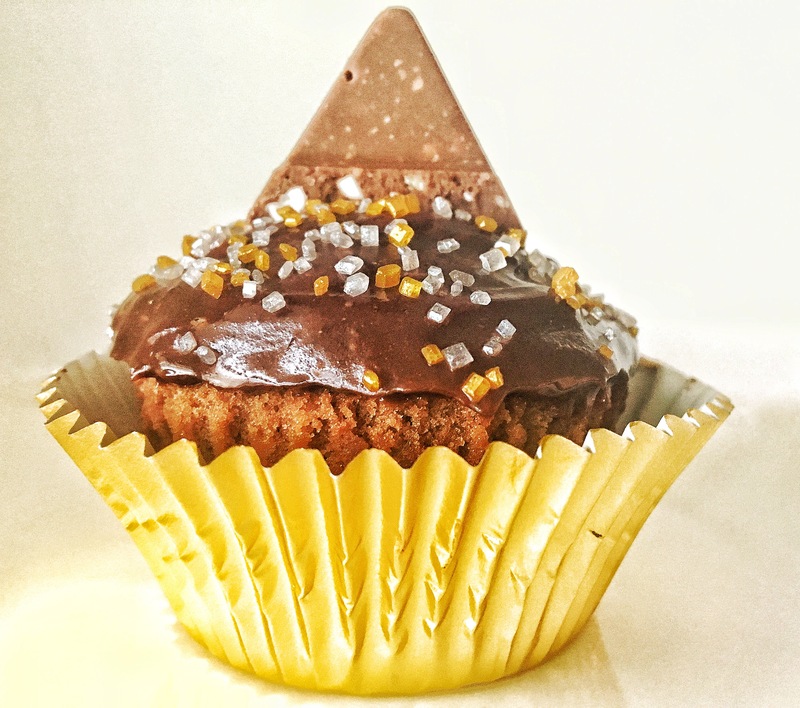 Place 2 triangles of Tobblerone in each cupcake cavity. Top them all with the batter, almost to the rim. Warm the heavy cream till it starts steaming but do not boil. Refrigerate for about 30 minutes to an hour till it thickens and cools down. Then whip it up some more. Using a spatula, spread the ganache on top of the cooled ﻿down mini cakes. Finally top them each with a tobblerone triangle. Don’t wait any longer, and say a quick happy birthday to me and dig in! And you will look as stunning in pink or white or black or yellow as in red! Feels good to know you remembered me Grishma. Thank you.